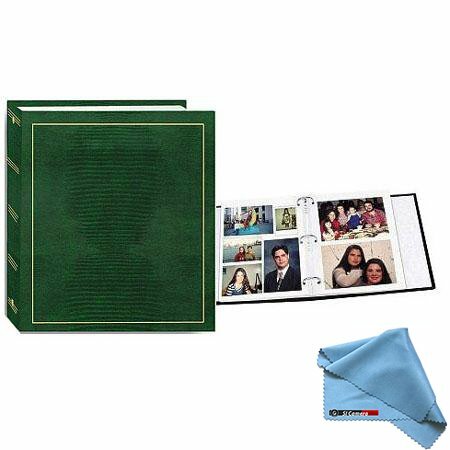 Quality clear plastic overlay self-adheres to pages, securely holding photos. Includes: 50 sheets (100 sides). 3-Ring binder accepts magnetic refills. Overall album dimensions: 10" x 11-1/2. Usable page area: 6-3/4" x 10-1/2". Album dimensions: 10"W x 11-1/2"H x 2-1/4" Thick. Acid free. Also available in Hunter Green, Navy Blue, Black, Burgundy, Red and Brown. Includes free cleaning cloth. Includes: 50 sheets (100 sides), Holds all size prints up to 5" x 7"
3-Ring binder has 1-1/2" O-rings spaced 4-1/4" apart, Usable page area: 6-3/4" x 10-1/2"